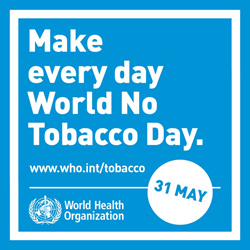 Every year, on 31 May, WHO and global partners celebrate World No Tobacco Day (WNTD). In 2019, WNTD will focus on "tobacco and lung health". Lung cancer: smoking is responsible for over two thirds of lung cancer deaths globally, and second-hand smoke increases the risk of developing lung cancer for non-smokers. Lung cancer is the leading cause of cancer death in most countries of the WHO European Region. Approximately 430 000 people died from lung cancer in the Region in 2018, and more than half a million new cases were diagnosed during that period. Quitting smoking reduces the risk of lung cancer: 10 years after quitting the risk falls to about half that of a smoker. Chronic respiratory diseases, such as chronic obstructive pulmonary disease (COPD) and asthma: tobacco smoking is the leading cause of COPD, a condition that results in a painful cough and agonizing breathing difficulties. It also exacerbates asthma, which restricts activity and contributes to disability. According to the latest available data, 3.6% of total deaths in the European Region were due to COPD in 2017. Early smoking cessation is the most effective way of slowing the progression of COPD and improving asthma symptoms. Furthermore, children exposed to second-hand smoke are at higher risk of developing frequent lower-respiratory infections and have a higher risk of suffering the onset and exacerbation of asthma, pneumonia and bronchitis. The link between tobacco smoking and tuberculosis (TB) is also well established, showing that the chemical components of tobacco smoke can trigger latent infections of TB. Smoking can also increase the risk of disability and death from respiratory failure in people with active TB. The campaign for WNTD aims to increase awareness about the particular dangers of tobacco smoke to lung health and the fundamental role the lungs play in the health and well-being of all people. It also focuses on raising awareness of cost-effective and feasible actions that key audiences, including governments and the public, can take to reduce the risks to lung health posed by tobacco. These actions include tobacco control measures outlined in the WHO Framework Convention on Tobacco Control (WHO FCTC) such as raising tobacco taxes, implementing smoke-free policies, supporting people to quit, raising awareness through mass media and enforcing bans on all forms of promotion. Full implementation of the WHO FCTC and other tobacco control measures will improve population health and well-being, and save lives.